Takeda is a brand new character who is the son of Kenshi and a student of Shirai Ryu. 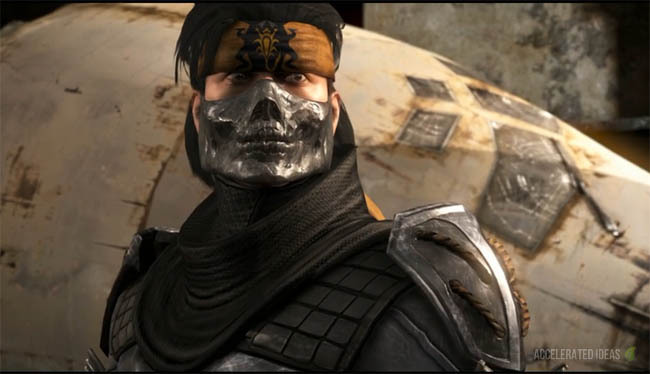 He makes his first appearance in the Mortal Kombat video game series but has been a character in the comics for some time. His trademark attacks stem from his bladed whips which are used in normal attacks and his special attacks. If you read the MK comics you'll know that Takeda grew up in the Shirai Ryu and was trained by Scorpion himself. He has some of the best range in the game and that's all thanks to his seriously overpowered whip attacks which form part of his common moves across all variations. You can easily choose to dominate the full width of the screen with Takeda's whip attacks but you can also use his Ninja training for up close combo attacks. It's great to have both choices because although the whips are great they're weakness lies in the speed of their execution. Overall, Takeda is an excellent character and certainly one of the best for combo artists who can perfect his combo streaks. Takeda swings his whips several times from the top down, lashing the opponent to the floor. The move covers a fairly wide area giving you a nice ranged attack to take the other fighter down. Takeda momentarily spins around in the air (whilst fire emits from his body) and then unleashes a powerful downwards kick towards the ground. You can control the range of this move and even use it midair, so there's a lot of options with that one. A downwards projectile which aims for the opponents feet. The enhanced version fires three projectiles which can also be charged - causing a delayed blast which is great for setting up combos. An amazing combo starter where Takeda dashes and repeatedly punches the opponents chest - Bruce Lee style. The enhanced (EX) version contains a final pop up (opponent bounces up) for a juggler combo starter. 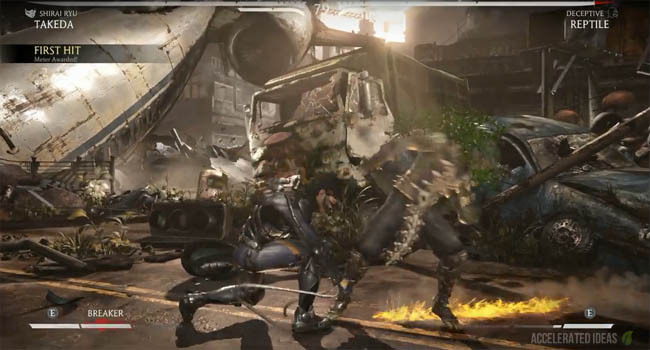 In this variation Takeda wears the Ninja mask and its in this class that he gains a Scorpion style "come over here" whip spear and a neat teleport trick. Again similar to Scorpions teleport, Takeda teleports behind the opponent with a flying punch. This move can be charged, giving you the option to let it go when you choose, but it can also be cancelled. The enhanced (EX) version is a double teleport (either side of the opponent) and provides a combo starter via a final kick pop-up. 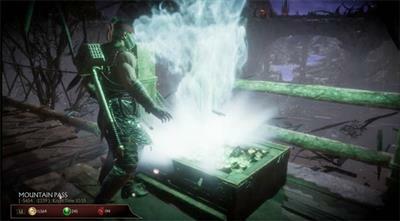 Players can also choose to teleport midair which will attack a jumping opponent and provides little risk because of immediate recovery following the move. You can also EX this move which makes Takeda teleport punch in midair and then he follows it up with another ground based teleport punch - guaranteeing you'll strike the opponent. A move inspired by Scorpion. He tosses his whip at the opponent's throat and then pulls them towards him. The enhanced (EX) version tosses two whips and the opponent bounces up for a combo starter. A jumping version of the above move where Takeda throws the whip downwards towards the opponent and systematically pulls them in whilst performing a flying kick. The Lasher variation is all about range, you get some really good variations on the normal moves. These include a slow poke (which is a low whiplash to the knee), a low scoop move that takes the player off their feet but the best is the Fist of Fury move. In this variation, the fury move turns into a "whip of fury" whereby Takeda lashes his whips like crazy. Combine all of that with new electrical whips and you've got one mean class. Takeda swings two whips either side above his head - the perfect anti-air defence for opponents jumping in. This move can also be used in combos for a combo ender or combo extender. A replacement for the Fist of Fury move, Takeda swings his whips furiously several times. A great move for mid combo or ending a combo. Takeda swings his whip low, causing the other player to trip and go to ground. The enhanced (EX) version pops the other player up for a combo starter. This is a really interesting variation that grants the player unique attacks utilizing Dual Pulse Blades. These blades are actually plasma swords that look similar to Jedi lightsabers. It's also the only variation that gives Takeda a projectile attack. Takeda's normal whip moves are replaced with glowing blade attacks. Place a sword on the ground and at any time summon the sword back, causing damage to the other player should they be directly above the sword. The sword will remain stationary for quite some time before it disappears giving you the option to scare your opponent whilst going in for attacks. A lazer beam projectile. Not something you often find in MK. Takeda swings his swords to deflect projectiles back to the opponent. A tricky move to time right though. From mid range, Takeda Swings his whips chopping off both of the players arms. He then spears the player through the mouth using his whip and drags it back to a pretty gruesome ending.